Planting the Green Seeds for a Golden Harvest: Comments and Clarifications on "Going for Gold"
The economic modelling work we have carried out over the past few years has been referred to and cited a number of times in the discussions of the Finch Report and subsequent policy developments in the UK. We are concerned that there may be some misinterpretation of this work. This short paper sets out the main conclusions of our work, which was designed to explore the overall costs and benefits of Open Access (OA), as well as identify the most cost-effective policy basis for transitioning to OA at national and institutional levels. The main findings are that disseminating research results via OA would be more cost-effective than subscription publishing. If OA were adopted worldwide, the net benefits of Gold OA would exceed those of Green OA. However, we are not yet anywhere near having reached an OA world. 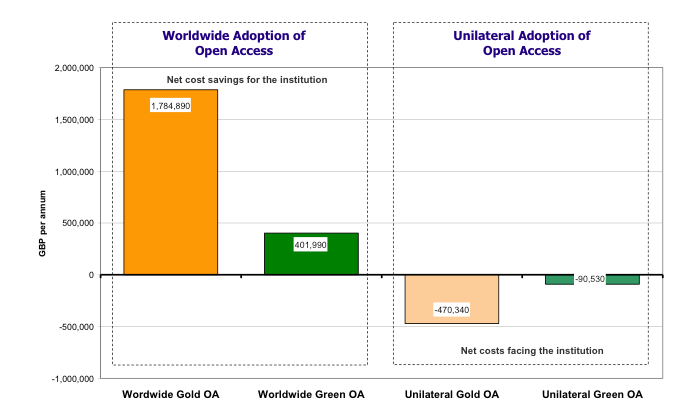 At the institutional level, during a transitional period when subscriptions are maintained, the cost of unilaterally adopting Green OA is much lower than the cost of unilaterally adopting Gold OA  with Green OA self-archiving costing average institutions sampled around one-fifth the amount that Gold OA might cost, and as little as one-tenth as much for the most research intensive university. Hence, we conclude that the most affordable and cost-effective means of moving towards OA is through Green OA, which can be adopted unilaterally at the funder, institutional, sectoral and national levels at relatively little cost. In the context of the Finch Report1 and subsequent policy responses in the UK, there has been renewed discussion of the costs and benefits of different models of Open Access (OA) and a re-examination of the evidence and analysis underlying the policies announced post-Finch. As we have contributed to that evidence and analysis, we thought it might be useful to try to clarify some of the issues, as there sometimes appears to be some misinterpretation of the implications of our work. For example, the Finch Report itself and a recent paper by one of the Finch committee members, Martin Hall,2 appear to suggest that our analysis supports the underlying recommendation of the Finch Report  that individual funders and institutions in the UK should adopt Gold OA in preference to Green OA. The research question underlying the analysis in Economic Implications of Alternative Scholarly Publishing Models (2009) was to compare all the costs and benefits associated with alternative publishing and dissemination models, using UK higher education as an example. The question underlying the analysis in Going for Gold (2012) was rather different. It explored the cost implications of alternative publishing/dissemination models for a small sample of individual UK universities, ranging from small relatively recently established institutions to large research-intensive ones. It is important to understand this difference in foci, which can be thought of as the difference between asking "What is in it?" and asking "What is in it for me?". The focus of the first question is an activity, and that of the second an actor. The latter compares a much more limited and local set of costs and benefits (e.g. it excludes many of the wider economic and social benefits that might arise through greater use of the research). As such, the reports address the key policy questions in their proper sequence. First, which is the most cost-effective model for scholarly publishing and dissemination (the activities)? Second, what are cost implications of the alternative models for key stakeholders, primarily for UK universities and the UK higher education sector as a whole (the actors)? Subscription or toll access publishing and OA dissemination or publishing perform different roles. To the limits of affordability, subscription publishing seeks to provide an institution's or country's researchers with access to the worldwide research literature; whereas OA seeks to provide worldwide access to an institution's or country's research output. These are very different things, but to compare cost-effectiveness it is necessary to compare like with like. It is also important to note that subscriptions do not (necessarily) cover the cost of subscription publishing. There is also advertising revenue, revenue from re-prints, page and plate charges, and there can be a range of membership and other subsidies to subscription journals. Conversely, journal subscription revenues might subsidise membership and other activities. So, despite the fact that it is what most people do, when comparing alternative models, it is not really correct to set OA publishing costs against subscription expenditures. Consequently, Economic Implications of Alternative Scholarly Publishing Models (2009), compared the cost of publishing UK article output under alternative models, including subscription. It then explored the wider benefits of more open access to research in the form of increased returns to R&D expenditure. The analysis established that OA dissemination models would be more cost-effective than subscription publishing, and the benefits of OA alternatives would outweigh the costs. While it was not the focus of the analysis underpinning Economic Implications of Alternative Scholarly Publishing Models (2009), it is possible to address the sectoral cost-benefit question by re-working the reported 2009 UK data to focus on actors rather than activities. Table 1 presents a brief summary focusing on UK higher education, setting the estimated annual costs of the alternative OA models (e.g. the costs of author processing fees and repository-related costs) against the annual savings (e.g. subscription and handling cost savings) in millions of British pounds at 2007 prices and levels of publishing activity.6 'Unilateral OA' is where a country or sector makes all its outputs OA in a world where others are not doing that, so subscriptions need to be maintained in order for researchers in that country or sector to access the rest of the world's outputs. 'Worldwide OA' is a situation where all outputs from all countries are Open Access. Note: Sets estimated higher education sector costs against cost savings at 2007 prices and levels of activity in millions of British Pounds Sterling. Data may not sum due to rounding. Source: JISC EI-ASPM cost model. Authors' analysis. Re-working the 2009 UK data in this way shows that any unilateral OA model would cost more, and the costs would exceed the benefits. Importantly in the current UK context, it also shows that the net cost of unilateral Green OA is much lower than the net cost of unilateral Gold OA. Moreover, in an all-OA world in which one of the alternative OA models prevails, the savings from Green OA exceed the costs by a factor of more than four, whereas those from Gold OA may be just 1.4 times the costs. When exploring the cost implications of alternative publishing models for universities, who face the trade-off between subscription expenditures and alternative OA costs, it is appropriate to set OA publishing costs against subscription expenditures. Going for Gold (2012) reports just such an analysis, based on detailed costs reported by a small sample of UK universities. As the wider benefits arising from greater accessibility accrue in the form of increased returns to research spending, these are not captured by the universities. Rather, they spill over to the national and global economy and society. Hence, they are not included in the Going for Gold (2012) analysis. The model underpinning the analysis in Going for Gold (2012) explores various alternative OA scenarios under the assumptions of: (i) worldwide OA (i.e. where the alternative model explored is assumed to be in place globally); and (ii) unilateral OA (i.e. where the alternative model is adopted by the institution alone, all else remaining the same). The latter is intended to shed light on the issue of transitioning to OA and identify the most cost-effective policy for doing this at the institutional level. Based on this analysis, we found that: so long as research funders commit to paying publication costs for the research they fund, and publication charges fall to the article corresponding author's home institution, all universities in our sample would see savings from worldwide Gold OA when article-processing charges are at their current averages, and research-intensive universities would see the greatest savings. Addressing the issue of transitioning to OA, we also modelled the cost impacts for an institution unilaterally adopting Gold OA publishing for its article output, while remaining a part of the current scholarly publishing system (i.e. maintaining subscriptions and paying Gold OA publishing costs). Under these conditions, we found that all universities would face additional costs for Gold OA publishing charges, and the more research-intensive universities would face higher costs. Universities adopting an all-Gold OA model for publishing their research results when the rest of the research community retains the current model (i.e. a mix of OA and subscription publishing) would find costs outweighing benefits in all cases (Figure 1). Note: Calculated using an average of the sample of the four UK universities in the study. Source: Swan, A. and Houghton, J.W. (2012) Going for Gold? The costs and benefits of Gold OA for UK research institutions, Report to the UK Open Access Implementation Group (July 2012). We also calculated the costs and savings that would accrue from Green OA (i.e. OA provided by authors self-archiving their articles in repositories, while journals remain subscription-based). We find that all universities would face some additional repository-related costs if they were to unilaterally adopt Green OA. However, for all the sample universities, during a transition period when subscriptions are maintained, the cost of adopting Green OA is much lower than the cost of Gold OA  with Green OA self-archiving costing the sample institutions around one-fifth the amount that Gold OA might cost, and as little as one-tenth as much for the most research intensive university sampled (Figure 1). There are a number of issues arising from this analysis that warrant clarification. First, even though some of the initial repository set-up costs have already been met and many UK universities already have an institutional repository and/or host established subject repositories, there remain substantial annual recurrent costs (e.g. annualised server costs, ongoing staff time costs, author depositing time costs, etc.). However, UK institutional repositories do more than support Green OA, sometimes much more (e.g. supporting research monitoring and evaluation, hosting a wide range of grey literature, etc. ).7 As a result, our allocation of all institutional repository costs to the provision of OA tends to somewhat overstate the cost of adopting Green OA at the institutional level. Second, we modelled a wide range of Gold OA Author Processing Charges (APCs), from the current average APCs charged (£571 per article published8) up to £2,500 per article published. We did this because it is difficult to predict how APCs might change over time. Nevertheless, we found that the cost of Gold OA would be higher than the cost of Green OA across the full range of APCs explored. Third, in a transitional period there is an issue of scalability and costs at the margin. Green OA scales relatively evenly at the global, national and institutional levels, as there are existing policies and repositories to use and upon which to build. However, Gold OA does not scale from the national or institutional perspective, as it simply involves considerable up-front costs without directly corresponding subscription savings. Moreover, there is a related issue of scaling across a wider remit. Gold OA is a model focussed on journal publishing, whereas repositories not only provide a basis for Green OA journal/article dissemination, but may also provide the basis for OA book publishing and the curation and sharing of research and other data, as well as a wide range of less formal research communication (e.g. theses, grey literature, field and laboratory reports, etc.). Hence, there are synergistic savings and other benefits from repositories, over and above those associated with Green OA, which are not captured in our analysis. Finally, there are related issues of value and different stakeholder interests. In general terms, Gold OA provides OA to entire journals (although not in the case of 'hybrid' subscription/Gold journals), while Green OA provides OA to articles. This difference is important for two reasons. First, from an economic perspective, there is no reason why we cannot have free articles and subscription journals coexisting, to the extent that journals add value to the articles. And, of course, this is why repositories that have long hosted most or all of the papers in their discipline, such as arXiv, have had little or no affect on subscriptions. Second, Gold OA and Green OA perform some complementary functions. In academia, journals play roles in aggregating material in a particular discipline, managing research quality control, and providing a hierarchy of quality and relevance that satisfies various academic and research user needs. Outside academia, users have different needs. They search using keywords or names and their target is a particular article: journals are of less relevance.9 For knowledge transfer, more immediate and greater economic impact, Green OA is likely to be more cost-effective. The evidence, both ours and that of others, clearly suggests that disseminating research results via OA would be more cost-effective than subscription or toll access publishing. In an all-OA world, it seems likely that the net benefits of Gold OA would exceed those of Green OA, although Green OA would have a higher benefit/cost ratio. However, we are not in an all-OA world yet, nor anywhere near it. The most affordable and cost-effective means of moving towards OA in the meantime is through Green OA, which can be adopted unilaterally at the funder, institutional, sectoral and national levels at little cost. Moreover, Green OA may well be the most immediate and cost-effective way to support knowledge transfer and enable innovation across the economy. 1 Finch, Dame Janet et al. (2012) Accessibility, sustainability, excellence: how to expand access to research publications, Report of the Working Group on Expanding Access to Published Research Findings (The Finch Report). 2 Hall, M. (2012) Green or gold? Open access after Finch, UKSG Insights 25(3). 3 Gold OA publishing refers primarily to journal publishing where access is free of charge to readers, and the authors, their employing or funding organizations pay for publication. Green OA self-archiving operates in parallel with subscription publishing and refers to the situation where academic authors deposit their work in on-line open access repositories, making it freely available to anyone with Internet access. 4 Houghton, J.W., Rasmussen, B., Sheehan, P.J., Oppenheim, C., Morris, A., Creaser, C., Greenwood, H., Summers, M. and Gourlay, A. (2009) Economic Implications of Alternative Scholarly Publishing Models: Exploring the Costs and Benefits, Report to The Joint Information Systems Committee (JISC) by Victoria University & Loughborough University. See also the related addendum. 5 Swan, A. and Houghton, J.W. (2012) Going for Gold? The costs and benefits of Gold Open Access for UK research institutions: Further economic modelling, Report to the UK Open Access Implementation Group (July 2012). 6 Details of the modelling can be found in Houghton, J.W., Rasmussen, B., Sheehan, P.J., Oppenheim, C., Morris, A., Creaser, C., Greenwood, H., Summers, M. and Gourlay, A. (2009) Economic Implications of Alternative Scholarly Publishing Models: Exploring the Costs and Benefits, Report to The Joint Information Systems Committee (JISC) by Victoria University & Loughborough University. See also the related addendum. 7Hall, M. (2012) Green or gold? Open access after Finch, UKSG Insights 25(3). 8 Solomon D.J. and Bjork B-C. (2012) A study of open access journals using article processing charges, Journal of the American Society of Information Science & Technology 63(8), pp1485-1495. 9 Houghton, J.W., Swan, A. and Brown, S. (2011) Access to Research and Technical Information in Denmark, Forsknings- og Innovationsstyrelsen and Denmark's Electronic Research Library. John Houghton is currently Professorial Fellow at Victoria University's Centre for Strategic Economic Studies (CSES) and Director of the Centre's Information Technologies and the Information Economy Program. He has had a number of years experience in information technology policy, more general industry policy and related economic research. He has published and spoken widely on information technology, industry, and science and technology policy issues. He has co-authored several chapters in the past years of the OECD publications Information Technology Outlook and Communications Outlook. He also publishes two annual updates on the Australian ICT industry sponsored by the Australian Computing Society. These reports use the path-breaking mapping methodology he developed with M. Pucar and C. Knox and published in Mapping Information Industries (Productivity Commission 1996). In 1998, he was awarded a National Australia Day Council, Australia Day Medal for his contribution to IT industry policy development. His research is at the interface of theory and practice with a strong focus on the policy application of economic and social theory, and of leading-edge research in various relevant fields. Consequently, his contribution tends to be in bringing knowledge and research methods to bear on policy issues in an effort to raise the level of policy debate and improve policy outcomes. Alma Swan is a consultant working in the field of scholarly communication. She is a director of Key Perspectives Ltd, Director of European Advocacy Programmes for SPARC, and holds honorary academic positions in the University of Southampton School of Electronics & Computer Science and the University of Warwick Business School. Her work covers market research and business modelling, project management and evaluation, research communication practices and behaviours, and the study and promotion of new forms of scholarly communication in the age of the Web. She writes and makes frequent presentations on scholarly communication issues. Ms. Swan has BSc and PhD degrees from the University of Southampton and an MBA from Warwick Business School. She is a Fellow of the Society of Biology and a Chartered Biologist, is an elected member of the Governing Board of Euroscience (the European Association for the Promotion of Science & Technology) and is the former editor of its online magazine, The Euroscientist.